If you read my earlier posts from the end of last week, you are already familiar with how I was feeling earlier this week. Basically, there wasn't any part of me that wanted to be here or do anything. I spent all of yesterday being lazy, essentially switching between reading and watching the West Wing for the entirety of the day. This morning I had plans to go to church with one of my friends in Jeomchon. I'm really lucky to have been put in a town with so many other Christians. We meet once a week to have a bible study, and it's really become one of the highlights of my week. We have about seven members in our group, which I guess is amazing because just a year ago there were really only two Christians out of the Jeomchon English teachers. Anyway, out of our group there's one other catholic, and we've been been determined to find a Roman Catholic church. It's proved more difficult than we originally thought, considering we see churches around us all the time. However, my friend was told by one teacher at his school that there is a catholic church in Jeomchon, so this morning we were ready to go to what we thought was a 10:00 mass. However, when we got to the church it didn't look anything like a catholic church, and I was pretty certain it had to be some other denomination. We also found out that the service didn't start until 11, which meant that we had an hour to kill. We were directed to a little cafe that is part of the church, so we sat there and had some coffee while we waited. As we were sitting talking, a group of kids entered. One girl immediately ran up and gave me a hug. I was instantly in love with these kids. There were three girls and one boy in this group of kids, and they continued to play with for the next twenty minutes. They were 8 years old, which means they knew a few basic English sentences, but were still amazed at seeing foreigners. This was an awesome way to start the day. I love teaching high school, but I've always been around young kids in some capacity or another, and since I've been in Korea I've really missed this part of my life. It did my heart well to be around some kids, even for just a little while. When it was near 11:00 we went upstairs to enter the church. We knew pretty much instantly that it in fact wasn't a catholic church. Of course, there wasn't much we could do at this point, especially since there was a nice older man who sat next to us and was translating everything the minister was saying. In the middle of the service, the man who was translating for us asked us to write down our names. Ummm ok? About ten minutes later the minister was talking, and before we knew it we were told to stand and saw ourselves on a big video screen that they have to project things during the service (interesting because the church isn't even that big). Anyway, everyone clapped for us as we were welcomed to the church. Oh man. So, the quest for a catholic church continues. After church, my friend and I went to Homeplus because we each had to pick up a few things. Of course, Homeplus is essentially one of those stores like Target, where a "few things" always turns into a $50 minimum. 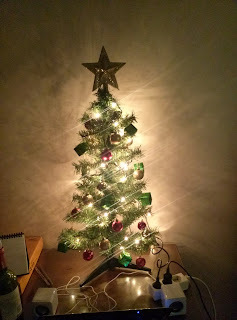 While we were there I decided to finally buy an actual coffee maker, and a little Christmas tree. Yes, the cold weather had officially made me decide that I just can't stand all this instant coffee anymore. So, even though it was overpriced, I now own an actual coffee maker. I also decided I can't stand the thought of going the whole Christmas season without a Christmas tree, so I bought small tree and the coordinating overpriced decorations. The shopping trip was made even more delightful due to the abundance of snapchats I received from my friends back home. As soon as we got back home I met up with them all on skype, and since it was about 1 AM at home by that point, they were indeed in rare form. Gosh, I miss that crazy group of people! After I finished my call with them, I met up with two friends and we headed downtown for some dakgalbi, which is my favorite Korean meal. 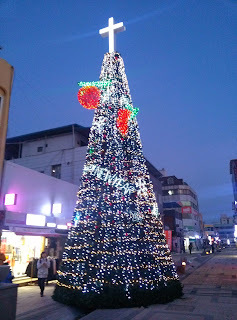 After dinner, we got some coffee in a nearby coffee shop until we saw the huge Christmas tree in the middle of the downtown area light up, at which point we headed outside to get a look. 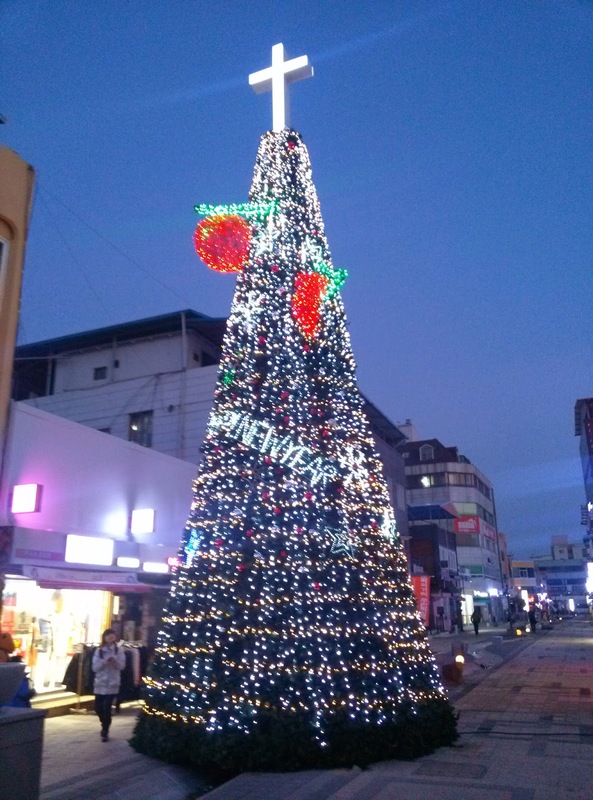 Apparently this is the first year there's been a tree like this in Jeomchon. I'm glad they're getting in the holiday spirit just in time for my first Christmas here. I also love that there's a CROSS on top of the tree. In a public place! It's not like Korea is an all-Christian country, there's a significant Buddhist population here. But still, apparently associating Christ with Christmas isn't as outrageous as it is in America. Also, notice the apple and omija, Mungyeong's signature fruits. Love you, Korea. 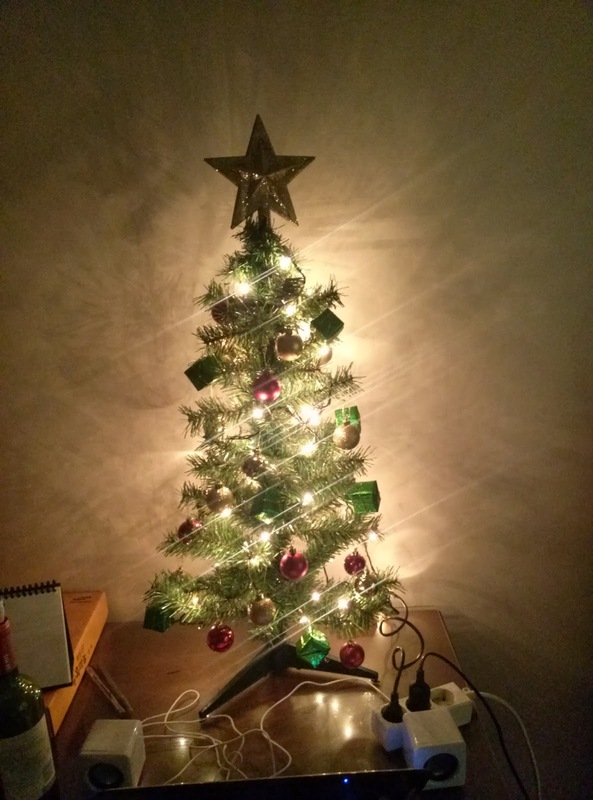 Inspired by the Christmas spirit, I promptly made a point to set up my own Christmas tree as soon as I got home. And here is my little tree! It's kind of a Charlie Brown tree--not too full and not too special, but now that my Christmas music is on and my living room is lit up by these lights, it feels a whole lot more like home, and it certainly feels much warmer in here. When this weekend started I felt the most homesick and for lack of a better word, "blah" than I had the whole time I'd been in Korea. Now that this weekend is finishing, I feel full of love and thanks for my life and those I had met in Korea. When I came to Korea, I said that I knew God would put me where I was meant to be, and now that I am here, I have no doubts that that is just what happened. Loved this post! So glad you are able to find people that share your faith. Good luck finding a church! Thanks, Liz! I feel really blessed for my life here in Jeomchon. We finally found a church and will be going this Sunday! Wooohoo!